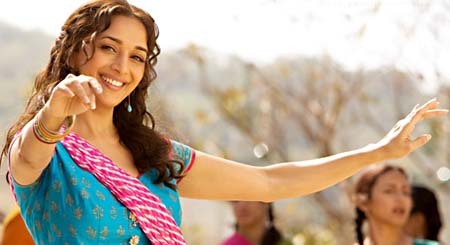 Sometimes it’s fun to see a Bollywood film… especially something like Aaja Nachle. It’s modern, fun, colorful, and has some unusual topics (for Bollywood at least). Anyone familiar with movies like Strictly Ballroom, Dance with Me, and Chocolat will like this film. Madhuri Dixit (the star with the BIG smile) is even more gorgeous and fit than in her ’90s roles. I always feel that her dancing is very natural, usually exceeding her acting. (She is a Kathak-trained dancer, and you can see the influences in Aaja Nachle.) This film centers on NRI dancer/choreographer Dia who returns to Simla (her small hometown) hoping to save the Ajanta Theater. The place, though dear to her, is falling apart. Politicians, businessmen, and most of the town want to replace it with a mall. Aside from Madhuri, there are a LARGE troupe of actors and dancers that show a LOT of talent! These include the always fabulous Konkona Sen Sharma, young Kunal Kapoor, Raghuvir Yadav (a great character actor seen in Salaam Bombay, Earth, and Water), charming Akshaye Khanna, and Irffan Khan (terrific in Maqbool and The Namesake). The local MP (Akshaye Khanna) tells Dia that if she can put on a successful dance show using ONLY town folks, Ajanta will be saved. However, because of past events/gossip, most of Simla thinks Dia (and by extension- dance) are BAD influences. Dia decides to do a song/dance version of the classic tragic love story Layla-Majnu. A local hoodlum named Imran (Kunal Kapoor) is chosen as Majnu, while the tomboy Anokhi (Konkona Sen Sharma) keeps auditioning for Layla. She has no talent, but is crazy about Imran. Konkona is great at playing tough, clueless, then later… vulnerable. Joing this odd pair of lovers are a shy government officer, an uptight politician, and a lovesick retaurant owner. And let’s not forget- the members of this motley crew ALL have to dance! The songs in this film fit VERY naturally with the actions (as it should be). The sets, costumes, and dances will draw you in (for sure). Madhuri portrays an independent, strong lady quite naturally. Konkona and Kunal have good chemistry, and also make good dance pair. The final show is shot differently than the rest of the movie (on purpose, said the director). The ageless tale of Layla-Majnu is very well-executed by ALL the actors/dancers- STUNNING!!! This was a VERY good adaptation of S&S, BUT it didn’t blow me away like Jane Eyre (2006) or North and South. The music was very tasteful, and the locations were cool (very much “out of the box thinking” from the production team). I felt that Hattie Morahan was a pitch-perfect Elinor: stately, sedate, serious, but very bright as well! Her tall stature and classic Brit features also added to her fitting-in w/ JA’s world. The girls’ everyday costumes were not as nice/elegant as in the Ang Lee version, but that didn’t bug me too much. Edward was VERY different from the book- no doubt to appeal to modern/younger viewers. He was the best-looking guy in the entire film- LOL! In the book, Edward barely even speaks b/c he’s so low-key. In the film, Dan Stevens (the actor) is so sweet, engaging, and (later on) emotional. He had VERY good chemistry with Hattie! It was like love at first site in the film. Marianne kinda grew on me; I liked her as she matured w/in the story. In the start, she was like a modern teenager (wanted to be crazy in love, worried re: clothes, and acted w/o thinking). She was good in the vulnerable scenes (w/ her big eyes, curls, and very small build). If you think about it, she and Col. Brandon are the “perfect” pair… He is wealthy, w/ an adventurous past, love of music, and a very romantic heart. She is an accomplished musician, full of passion, w/ an independent spirit. I liked how this film showed their courtship before the arrival of Willoughby. “He’s the only one one can have an intelligent conversation with,” Marianne tells her mom and sisters in one scene. Of course, no one can replace the awesome job Alan Rickman did w/ Col. Brandon… BUT David Morrissey did a PRETTY good job here! He thinks he’s too old, too heatbroken, and not handsome enough for Marianne (at first). But he keeps an eye on her, as a very loyal friend, even when she’s head over heels for Willoughby. I LOVE when he catches her as she faints in the London ball! The little scene he had w/ Eliza’s daughter and her baby was very sweet. What stood out to me were the (extension of) men’s roles. Willoughby was more troubled/darker than in Ang Lee’s film, but his scenes after the break-up were quite strong. You could tell he was suffering a LOT at those times. There are things dramatized that were only hinted in the book; I esp. liked the swordfighting part! Margaret was a clever, funny child who said things the grown-ups could not; her acting was natural. I would recommend this to any JA fan! Chitra Banerjee Divakaruni is a Bengali Indian writer who came to the US a young lady for grad studies. She didn’t grow up wanting to become a writer, I was surprised to learn. She is now a professor of Creative Writing at the University of Houston, a wife, and mother of two sons. She is the FIRST desi writer I ever learned about! 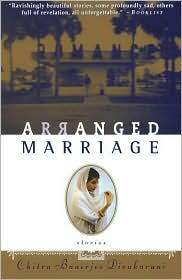 I believe read her first collection of short stories, Arranged Marriage, in 1998. My mom has read a few of her books also. I have Arranged Marriage (signed by the author- yaaay!!! ), Sister of My Heart (a novel) and The Unknown Errors of Our Lives (an even better set of stories than her first). One of Chitra’s novels (The Mistress of Spices) was made into a movie starring Ashwariya Rai (a huge Bollywood star) and Dylan McDermott (sigh…). I met Chitra at the book signing after her lecture at The Asia Society recently. She was very humble, funny, and approachable. CBD was an animated/engaging speaker; she read a section from her newest novel- The Palace of Illusions. The (desi intellectual) woman who interviewed her was hilarious, and the audience LOVED it! The coolest part- I spoke a LITTLE Bengali with her! Cotton, tea pouring, and firm handshakes NEVER looked SO good! A very unlikely romance, labor union struggles, friendship across social classes, and other very “modern” themes are found in this timeless story (not unlike the work of Jane Austen). However, unlike JA, Mrs. Gaskell delves into the lives of the poor/working class in Milton (a city VERY similar to Manchester) where she moved after she married. I’m reading the novel, and this adaptation stays close to it. 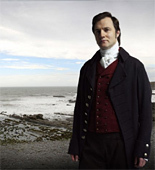 If you haven’t seen this 2004 show yet, check out You Tube (under MissJaneAustenfan, a young Spanish woman who is ALSO crazy over period dramas). Or you can buy the DVD (set of 2 discs) online or at your B&N store. It’s worth it! UPDATE: It’s now also on Netflix! The time period is AFTER that of JA- N&S is set during the start of the Industrial Revolution in Victorian England. 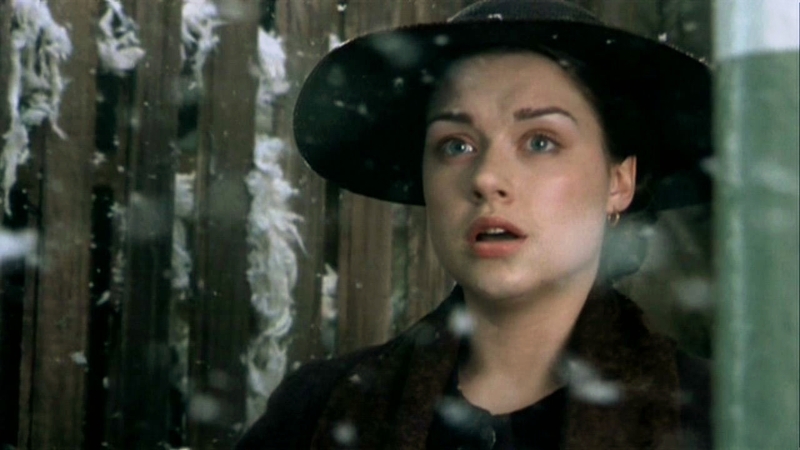 The main protagonist is Margaret Hale (Daniela Denby-Ashe), around 18 at start of tale, who moves from the South (Helstone) to the North (Milton) with her parents and trusty old servant. Mr. Hale (Tim Pigott-Smith- from The Remains of the Day) didn’t lose his faith; he didn’t like how the church was being run. To him, it was “a matter of conscience.” He became a tutor instead. JA’s parsons would NEVER do such a thing- leave job and move to rough, big city! When I first saw N&S, it took me away to a different place/time. The music is AWESOME! This is definitely NOT like the (usually) green, sunny, cozy JA world! It is harsh city life, including social isolation (MH is so desperate for friends that she follows a mill worker on her way home! ), poverty, hunger, etc. MH, who is from a small town, is at a loss for a few months; she misses Helstone desperately. Her clothes, as we learn in Episode 2 are from LAST year. “Mind you- you’ll have to get much smarter clothes if you want to catch him,” her aforementioned friend, Bessie Higgins, jokes. The colors she wears are dark, and her style is very simple. UPDATE: Bessie’s dad is played by Brendan Coyle (currently on the hit show Downton Abbey)! Mr. Thornton the wealthy mill owner, has his business clothes (not so fine), but dresses up very sharp for tea, parties, etc. His height (he’s tall in the book, too), stern brow, and deep voice also give him a formidable appearance. He’s described as having “perfect teeth” in the book, energetic, with an air of importance about him. We learn that the Hales married for love, and Maria was MUCH wealthier than her learned parson husband. In the book, Mr. Hale is described as being tall, dark, and handsome. Mrs. Hale was brought up with the best that good society could offer. She was also very pretty, and had many marriage offers, but chose love over money. Margaret’s (maternal) Aunt Shaw has a house in the best part of London. In the book, this aunt married an older military man who had money, too. Usually in JA’s novels, the girls fall for a guy WITH money. Aunt Shaw was therefore very happy when her daughter married for love. “Edith can afford to marry for love,” she says in the movie. The main male protagonist, Mr. John Thornton, is played wonderfully by Richard Armitage (currently in the BBC TV show Robin Hood). Mr. Thornton is definitely NOT like a typical JA hero. He is a businessman, first and foremost, strong-willed, yet honest and open to new ideas (he is one of Mr. Hale’s private pupils). You won’t see him riding, shooting, though he (sometimes) goes on long walks across town to clear his head. When the story begins, he is about 30, and a BIG success- owns a cotton mill (Marlborough Mills) and serves as town magistrate. In his mother’s eyes, he is the best son anyone can have. “I became head of the family very quickly,” he confesses when MH comments that he was “blessed with good luck and fortune.” JT had to leave school as a teen and work to support the family, his mother (played by Sinead Cusack from Eastern Promises; married to Jeremy Irons!) and baby sister. Are the two (possible) lovers on the same SOCIAL level? Hmmm… it was a BIT sketchy in Gaskell’s time. JT’s an up-and-coming guy (but is he a “gentleman”?) whereas MH’s father is an Oxford-educated gentleman. Does JT care about the welfare of his workers, or solely profit? (MH is NOT sure about his TRUE character for QUITE some time in the story.) Shades of Lizzie and Darcy here, of course! I am in the middle of the novel, and will write MORE about that later. You must see the show for yourself to uncover more of this GREAT tale!